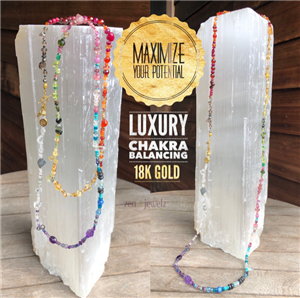 Maximize your potential with this FIRST TIME EVER luxury chakra balancing gemstone necklace. Featuring a solid 18k gold zj coin, 18k gold toggle clasp and 18k gold accent beads. Each gemstone was hand picked and carefully placed to ensure the proper flow of energy in this masterpiece. Adorned with a raw Diamond & 18k gold handcrafted tassel. Wear this necklace long for a casual look or wrap it twice for a trendy vibe. Where ever you go you will receive oohs and ahh's over this beauty. There are 7 main energy centers in the body, known as chakras. Each chakra is located throughout our body so that it correlates to a specific body ailment and physical dysfunction; each energy center also houses our mental and emotional strengths. When we have a physical issue, it creates weaknesses in our emotional behavior. When we release the stale energy from the body, it can undo any tightness, stiffness or malfunction in that area. The clearing of the energy can also balance our emotional state of mind. The Chakra Mind-Body Balance is a two-way street: if there are certain fears and emotions we are holding on to, we experience physical restrictions, too. If you have achiness or stiffness, or certain reoccurring emotions and fears, wearing our chakra balancing bracelet can help to unblock and clear this negative energy from your body. There are 7 Chakras, located in a line aligned with the spine. The crown of the head, third eye, throat, heart, solar plexus, sacral and root. Each Chakra corresponds to a gemstone that helps to heal and balance that chakra. When the 7 Chakras are functioning properly, the body's physical and subtle energies are in balance and harmony.